The Bevelled strut mount is manufactured from a high quality, heavy weight (1050 gsm) matt card, whilst the backing and strut are made of heavy weight (890 gsm) grey card. 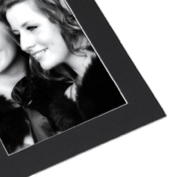 It is available in black, with a white bevelled edge to the image aperture to highlight your image. The corners of the aperture and bevel are both squared. The strut may be folded to allow this product to stand in either portrait (upright) or landscape (view) format (see options below). Be the first to review “Bevelled Strut Mounts” Click here to cancel reply.